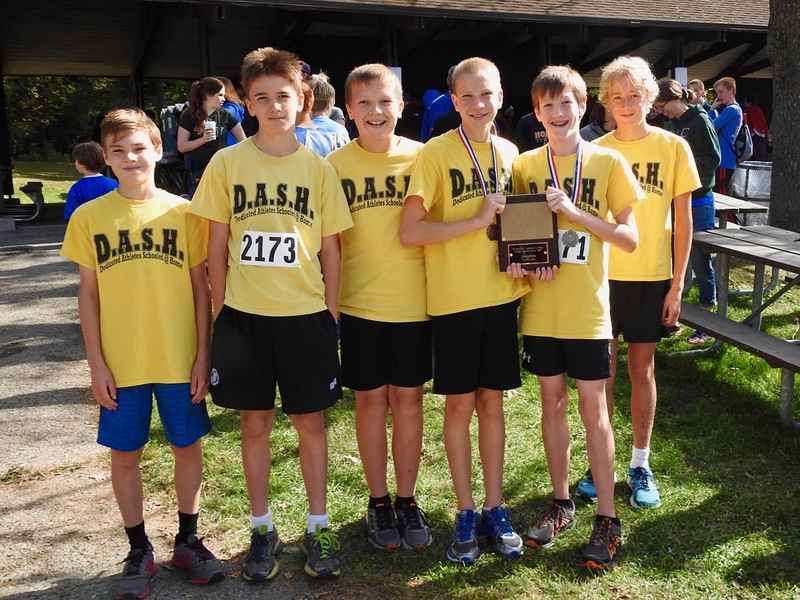 The middle school cross country had the first of its three meets yesterday, running at Kettle Moraine Lutheran High School in a meet hosted by our homeschool friends to the north, WCHSA. It was a struggle for the team to stay warm with the temperatures dropping fast just before race time. But once the gun went off, our team heated up the 2500 meter course with some great running. Our 6th and under girls team, which was much to the under with three 2nd graders and a 4th grader, toed the starting line first. Julianna Caspers got pushed and took a tumble near the start, but got up and paced Angela Walters through the first loop. They were joined by another little girl who was keeping up with our two second grade stars. It wouldn’t last. Julianna never slows down, and she ended up with the lead pack of six girls. The frustration was evident on the other girls faces as they tried to keep up with Julianna. But the girls racing up there are very good and Julianna settled for a 6th place finish with a blistering time of 11:09. Angela Walters was the next little girl in. She lowered her great time from last year by over a minute and a half and earned the 19th place ribbon. Jenna Walters and Mary LeSac made this group an impressive foursome. How good will this team be in a couple years? We ran seven 6th and under boys. Leif Kostrzewa had a plan to push it hard early. He was able to maintain his great start all the way to the end and finish 8th overall. He has now taken his talents to another level. He will be one to watch the rest of the season. Joshua LeSac had another good race. He is running hard every time out and has lowered his time by a minute in the last year. Daniel Caspers started a little slower, but once he got up the big hill the passing began. He caught up to Joshua in the home stretch and finished just a second behind in 25th place. Seka Kostrzewa was back and running fast as usual. He will be helping the team the rest of the way. Next year I will let him start helping earlier. Joshua Lipski had a great finish, getting past everyone near him before crossing the finish line. He is really becoming a racer. Elijah Anumolu worked hard early, then struggled some later in the race. And Andre Coulter cut his time down considerably from last week. These guys really got the coach excited. The 7th and 8th grade girls were next. Like last week, Faith Caspers got out fast and then held her spot the whole way until just before the finish. She ended up earning the 8th place ribbon. Her time – 11:13. There was a wait after Faith finished, but then Kayla Walters was seen charging in leaving everyone else behind her. 9th place was Kayla’s. Mia Wickman has another good day, but just missed out the numbered ribbons with her 22nd place finish. Naomi Zhou did some good running and was our next girl in. Katrina Lipski was much happier with her race this time so we know she ran good. In the 7th and 8th grade boy race, Joshua Anumolu got out fast again and hung on for a top-10 ribbon. John Klaves put together another great race, including an inspiring charge up the hill, and finished 16th overall, He left 60 boys behind him. Joe Laufenberg was a little faster this time out. He needs to stay healthy and keep practicing. Overall this team had an outstanding day. 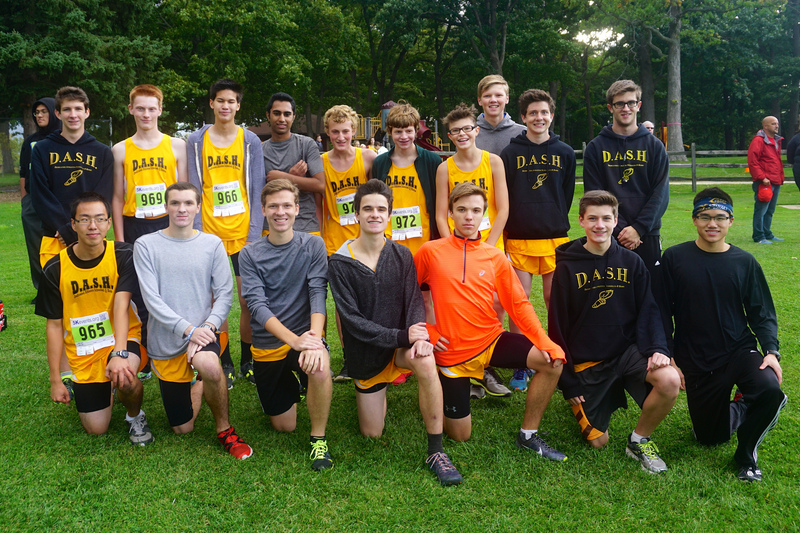 We took home top-10 ribbons in every race and had 10 of our 19 runners place in the top-25. We are now in mid-season form and should be ready for our big races ahead. Now let’s hope we all stay healthy. 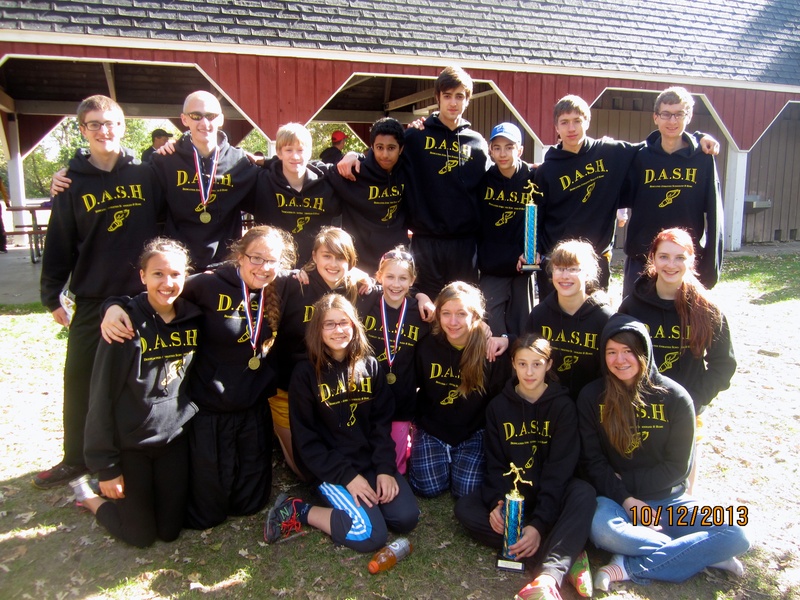 Running in cold weather can take its tole on a team if they do not dress appropriately. Thanks to Ed Beck for his assistance with the coaching and for his help with scouting the course. 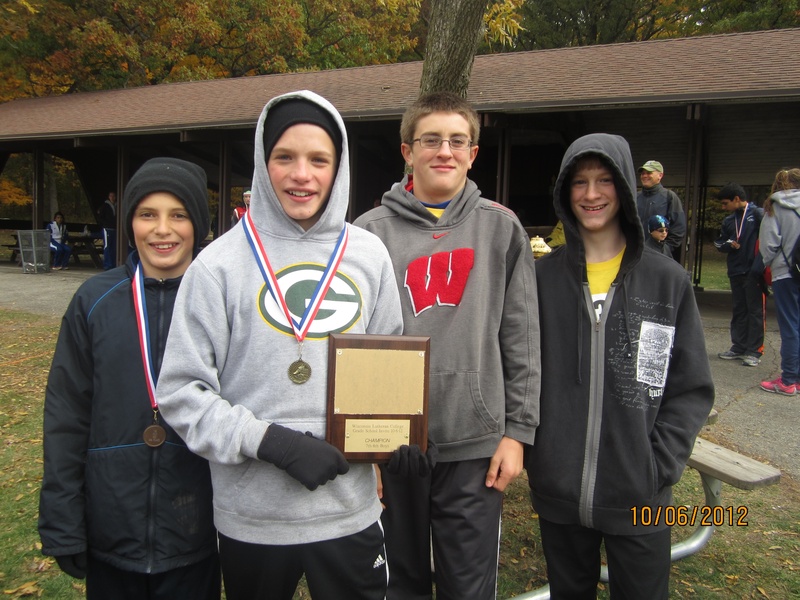 Thanks to the folks at Kettle Moraine Lutheran High School who score the meet and let us use their course. Thanks to all the parents who read my email and brought plenty of warm clothing. Most of the teams were shivering in short sleeves. And thanks to the camera lady who took most of the pictures. This week we have to stay ready to run a couple more meets. For those who were disappointed when the fun run was cancelled, we will have another chance to run in one next week. Bring your running shoes. 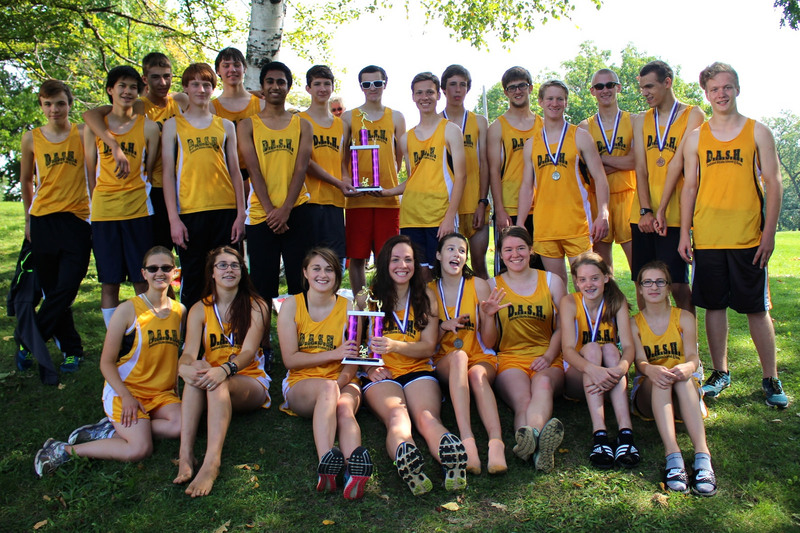 Our high school cross country team came ready to compete yesterday at Mitchell Park in the Bradley Tech Trojan Invite. The team had not had a meet for 15 days, and had a chance to put in some good practices to get ready. We have run this meet every year we have had a high school team. We’ve taken home plenty of medals, but never placed higher than 3rd in the team scores. The hopes were high that this would be the year we would move up in the standings and take home a little more hardware. 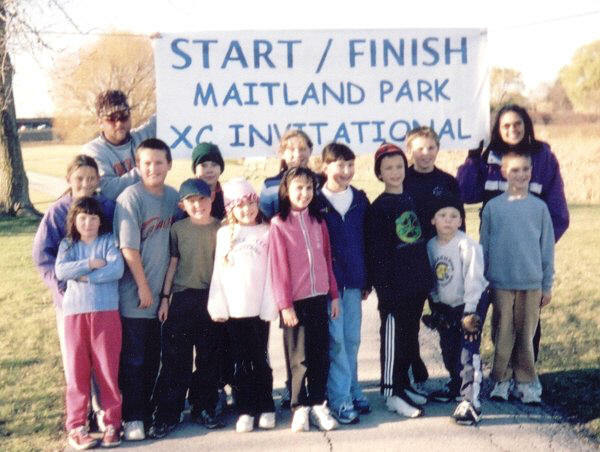 The course was changed from past years due to construction at the park. It is now much more difficult, requiring the athletes to go up the big, steep hill two times. It was not a day to worry about times. It was a day to persevere to the finish; a day to give your best effort to stay ahead of as many competitors as possible. Our JV runners would get first crack at the new course. Johannah Lee toed the starting line for the first time in a cross country race. She went out conservatively, but it was not long before she moved up into 3rd place. As the field behind her struggled on the difficult course, Johannah kept pushing forward and held her spot to the end. It was an encouraging first race and raises our chances for a good showing in Rochester. Andrea Coulter went out strong and was running with the leaders early. The course humbled her some from then on, but she held on for a top-10 ribbon. Stefanie Klaves enjoyed her day in the JV race. She stayed close to Andrea the whole way and finished a couple spots behind her in 12th. Danny Wickman had an inspiring start in the boys JV race. He was the early leader before settling in for the long haul. He gave us his usual great finish, and capped off some good DASH JV racing. The varsity girls were inspired at the start and got out fast. At the half mile mark all five of the girls were in the top-6. Then the tough course spread the race out a bit. Andrea Beck remained the leader throughout the race. A few Rufus King girls kept her in their sights, but her relentless pace proved to much for the field. It would be a first place finish for Andrea! Kayla Bruton was determined to have another great race and she did. The course wore her out some, but she was able to stride in for a 6th place finish. DASH newcomer Marlissa Muckerheide impressed everyone with her effort. She fell down the big hill both times, but got up and just kept going. She had used up all her energy by the time she hit the finish line and collapsed after crossing the line. A paramedic parent from Rufus King was on hand to help revive her, and she looked fine when called up later to receive her 8th place medal. Lucretia Nyhart was the only athlete to lower her best time this year on this tough course. She kept Marlissa in her sights, and raced in to a well-earned 11th place finish. It was great to see Lucretia running this well. Zipporah Caspers ran well early, but was definitely slowed by the tough course. She finished in 16th place, just missing out on an individual medal. It was a great effort by the girls. Now we would have to wait for the award ceremony to see just how well the team did overall. 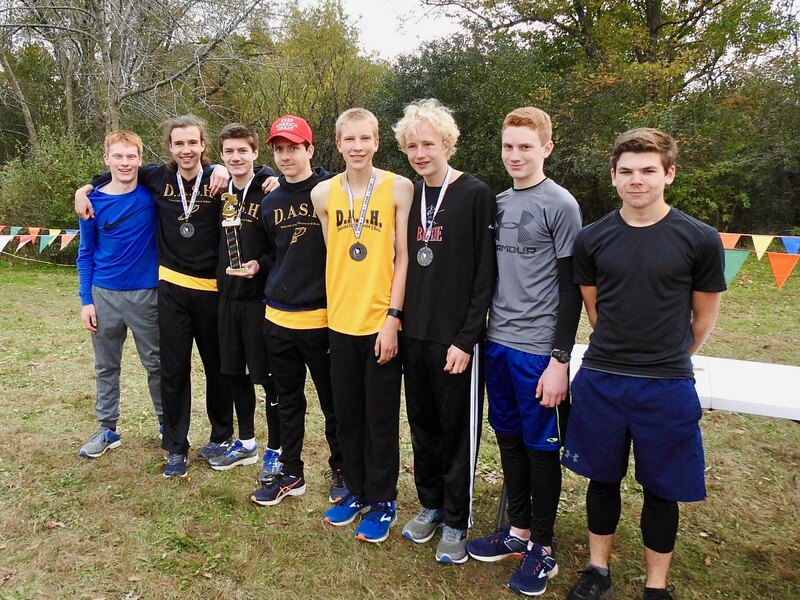 It was now time for the varsity boys race and our attempt to dethrone the Rufus King team who had won this meet every year for as long as we have had a high school team. Ransom Nyhart paced Jacob Dickman through the first half of the course with both boys staying ahead of the top King athlete. Jacob took control of the race late with a blistering last mile. It was a great win for Jacob, and it gave the team an early lead. Ransom Nyhart overcame tumbling down the big hill to leave everyone behind him but his teammate Jacob. Our stars had come through. 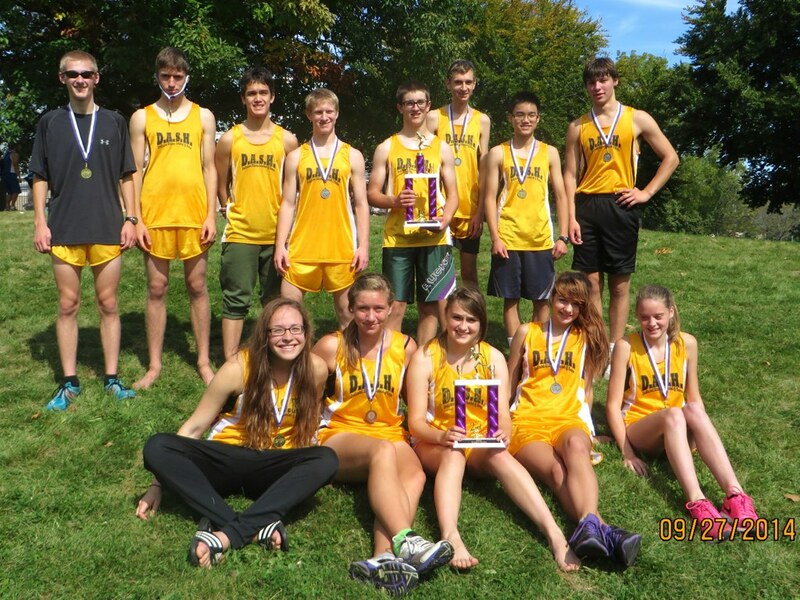 Rufus King had their first runner place third, but Justin Chu was right behind giving us 3 of the top 4. Justin has the confidence to run with the leaders now. He kept Ransom and Jacob in his sights the whole way and has taken this team to yet another level. After Justin’s finish, the DASH fans turned to cheer Joe Hughes’ sprint to the finish. Joe always gives us a great race. That gave us 4 of the top 6, but there’s more. Matt Lange moved up methodically throughout the race with some inspiring running and was the next runner in. Then John Sherman outkicked a couple athletes to finish right after Matt. 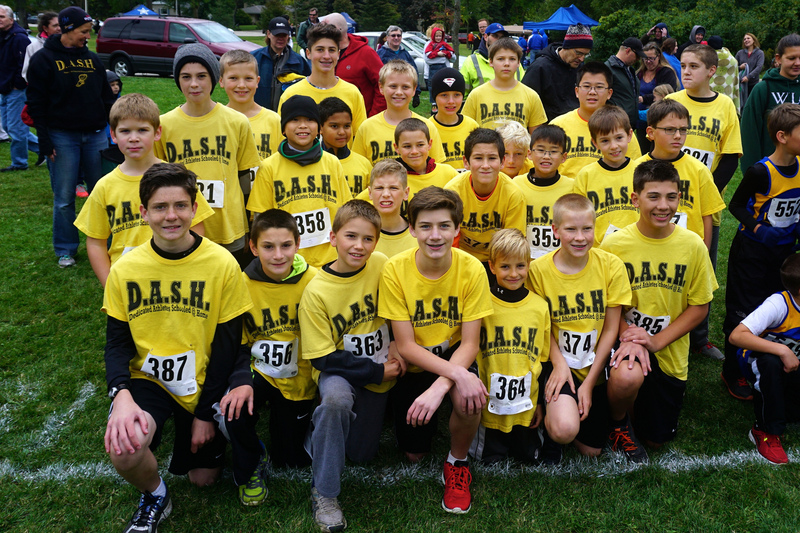 Eight boys had finished and six had donned DASH yellow. A legendary showing! Samuel Zinkgraf was back and looked pretty good coming off a football injury. He will be keeping up with the other guys soon adding more depth to the team. It is good to have him back. The awards ceremony was extra special. We had 10 athletes called up for top-15 medals. Then the girls team was awarded the 2nd place team trophy. They finished just nine points out of first. A gasp, then a cheer, went out when the boys winning team score was announced – 20 points! The first place trophy was ours. We waited 7 years to win a trophy at this meet, and now we had two! It was time for celebrating, and a time to gather together for some team photos. Thanks go out to all the DASH fans, including Pete Dickman on his bike, who followed the athletes and cheered them on all over the course. Thanks to our official scorekeepers, Mary Beck and Emily Caspers. Thanks to the camera lady, Daniel Caspers, and myself for the great photos. Thanks to Dave Anderson, a Rufus King father and a paramedic, for assisting Marlissa back to health after the race. We need to keep her healthy the rest of the way. We have three weeks left in the season, including another big meet this Thursday that we should be very competitive in. You will not want to miss it! 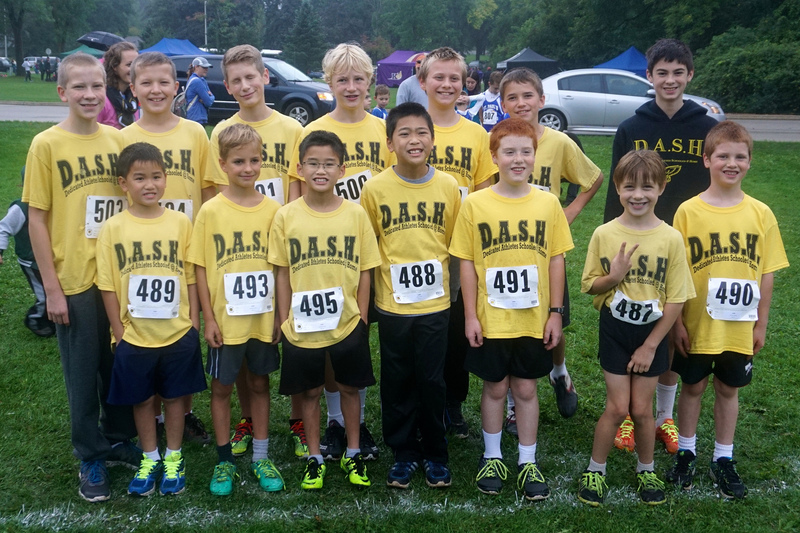 The DASH middle school cross country team competed in Elkhorn on Wednesday. It was our last public school meet of the season, but with only five teams participating, it had a much different feel than our earlier meets. With perfect weather and a flat 1.5 mile course before them, the team was told to push the pace early and try to get a good time. It worked better for some than others, but overall the team is now in mid-season form and hopefully ready for our three meets next week. The 7th and under girls got the racing underway. Julianna Caspers was running in about 16th place at the half mile mark and told she would have to move up to get a top-15 medal. She immediately sped ahead and kept up her relentless pace to the finish and caught all but six girls before it was done. It was 7th place for the 7-year old star! Angela Walters picked up where she left off last season, proving she can also run with the much bigger girls. It was her first race of the year and she was able to earn the 25th place card. Naomi Zhou is looking better and running faster each time out and was our third girl in. Sarah Lindberg went out a little too fast, struggled in the middle of the race, but finished well. It was her first race and one to learn from. Jenna Walters is also learning and getting better with each race and finished right behind Sarah. Leif Kostrzewa led the 7th and under boys through the course. Leif ran fast from start to finish, and he needed to to stay ahead of Joshua LeSac, who was never more than a few steps back. Daniel Caspers fell behind Leif and Josh early and got caught running in a pack who would not let him pass. Daniel is running pretty well and should find it easier going in the non-public school meets ahead. Ed Sherman worked hard throughout and came in as our fourth runner. Joshua Lipski stayed a few steps ahead of Elijah Anumolu the whole way. Joshua and Elijah both ran better than they ever have. Andre Coulter rounded out our good sized boys team. Faith Caspers had some work to do to beat Julianna’s time in the 8th grade race. Faith came around the half mile mark in 8th place and was able to hold on to that spot to the finish. She clocked in with the exact time as her sister – 10:54. Kayla Walters put in another good race, but just missed out on a medal with her 12th place finish. Mia Wickman is really running good now and is keeping Faith and Kayla in sight. Her effort earned her the 18th place ribbon. Katrina Lipski never looked comfortable on the course, but stayed steady to the finish. Cross country is not an easy sport. Joshua Anumolu sped out to a great start and hung on for the 9th place medal in the 8th grade boys race. Joshua’s time was 30 seconds faster than last year on this course. John Klaves has had a good day every time out thus far. He clocked in at 10:19, good for 20th place. It was a great day to watch a race, and the athletes proved to be especially exciting. Watching everyone improve each time out is very encouraging. I have held out a few of our youngest stars thus far, but from here on out they get to run. With six meets left, including three next week, we will get to see these athletes plenty more. It should be fun. Thanks to everyone who made the trip to Elkhorn. Thanks to Ed Beck for his help with the coaching and for being our official scorer. Thanks to the camera lady for taking the photos, at least until the camera died and I took over. Thanks to the Elkhorn team for inviting us to their meet. It is nice to have a smaller meet on the schedule. The meets are coming up fast now so I will see you all soon. The middle school cross country team warmed up in a little rain yesterday in Muskego, but the skies cleared up by the time the races began. 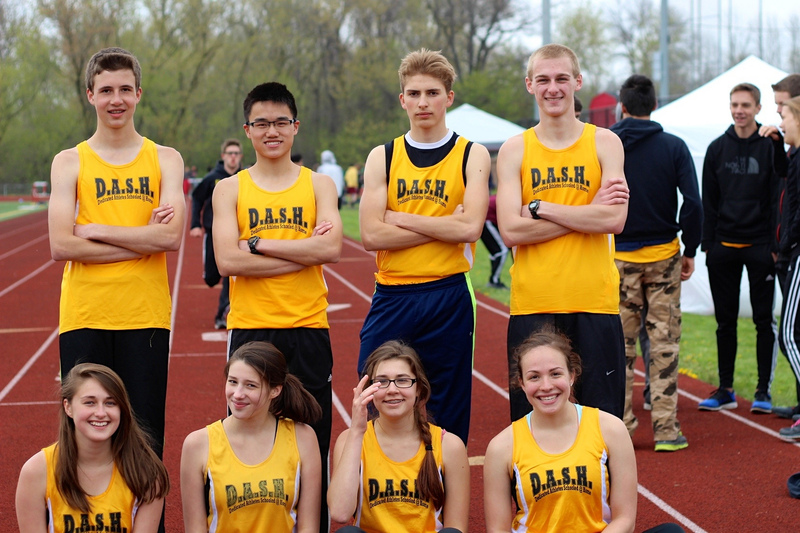 We fielded one of the smallest teams in this big public school meet. That hurt us in the team scores, but we ended up with more than our fair share of top-50 ribbons proving that this team is going to be pretty good. 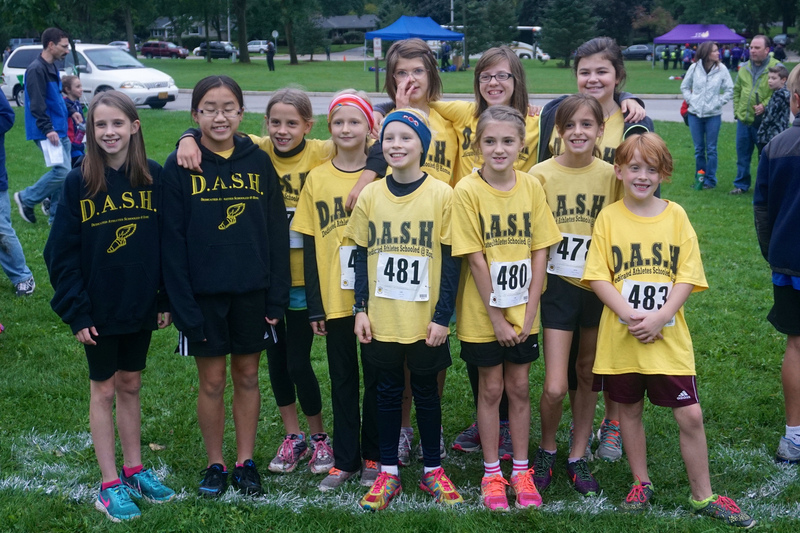 Julianna Caspers led the way for the DASH 7th grade and under girls team. Julianna had a little trouble maneuvering through the heavy traffic early, but she later moved up to capture the 48th place ribbon. Naomi Zhou ran well in her second meet as she continues to improve and gain confidence. She cracked the top-200. 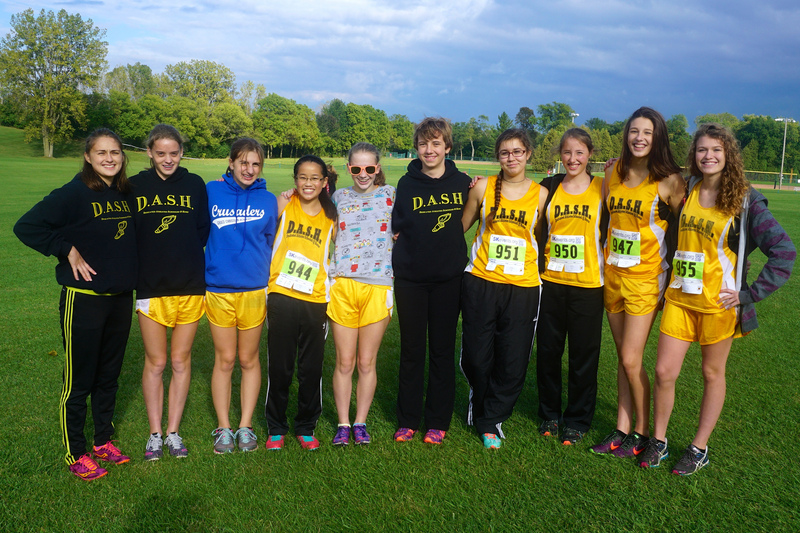 Jenna Walters was given a DASH jersey in the parking lot, and ran in her first DASH race. She worked hard and finished ahead of over 50 athletes in a good first showing. She will get to wear her new Jersey again later this year. Leif Kostrzewa assumed his role as DASH star once again after a tough first race. Leif moved up relentlessly during the race and beat over 200 boys to the finish. Joshua LeSac was running side by side with Leif, but then took a spill on the home stretch and had trouble to the finish. Joshua is working hard and is going to give us a really great race soon. Daniel Caspers ran a steady race and finished in the top half, and Elijah Anumolu cut over two minutes off his time from last year to round out our 7th grade boys team. Kayla Walters was the pace-setter for the 8th grade girls team. Kayla was fast from start to finish and stayed a few steps ahead of Faith Caspers the whole way. Faith and Kayla earned the 31st and 34th place ribbons for their effort. Mia Wickman is getting faster each week. She showed off her speed at the finish and did not look very tired. Now we need to get her to push a little harder early. Katrina Lipski was much happier about her race this time and she posted a very nice time. In the 8th grade boys race, Joshua Anumolu raced out with the leaders, but slowed down in the middle of the race. Joshua had a little trouble breathing in the cold. Nonetheless he put up our best time of the day and finished in 32nd place. John Klaves is running better than he ever has right now. He finished close to Joshua and took home the 44th place ribbon. Nice! Joe Laufenberg ran out fast, but was then slowed with a bad side ache. He came back to finish well. It was Joe’s first race and a definite learning experience. Our veterans ran like veterans, and the newcomers are getting better. Now we need to keep improving with each race, and we especially have to keep everyone healthy. Thanks to Ed Beck for his help with the coaching. Thanks again to Ed, along with Jodie LeSac, for being our scorekeepers. Thanks to Danny Wickman for collecting the placement cards for me. He showed a natural talent for that job. Thanks to Zipporah Caspers who got the photos. 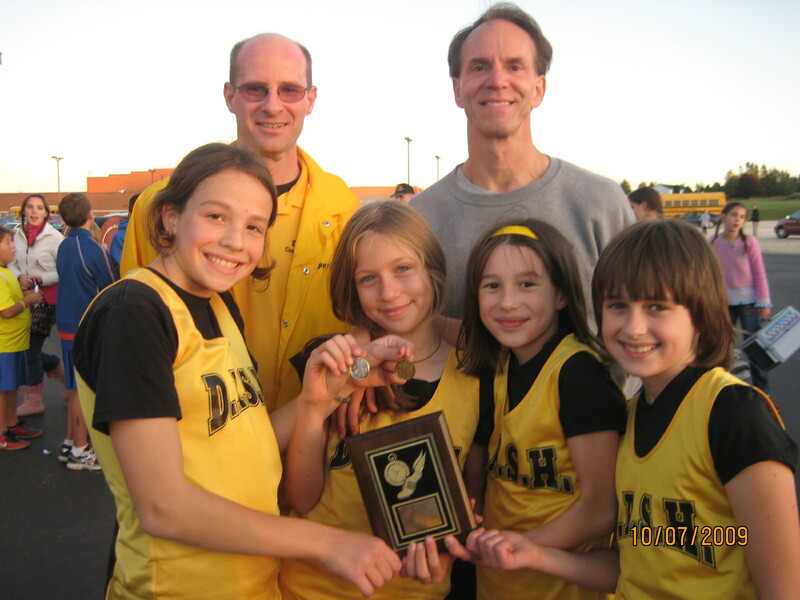 And thanks to the parents who got the athletes to the meet and then became great DASH fans. 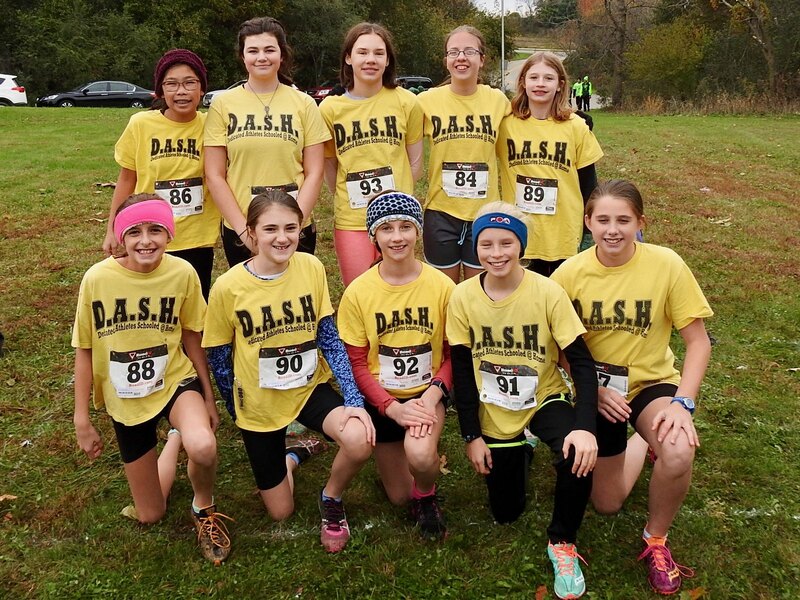 Both the middle school and high school DASH cross country teams were up in Mayville Friday afternoon to compete in the Mike Hurlbert Invite. It was as cold as it gets for mid-September with the temperatures topping out in the 40’s. A slight drizzle kept everything wet, and the winds were calm. Yet it all added up to some great racing. The times were fast with everyone ending up posting their best time of the year. The day started with some problems. 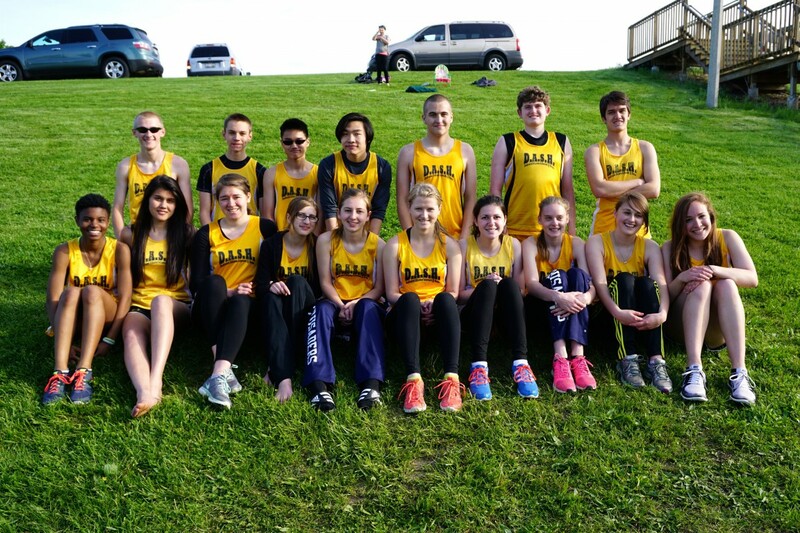 The WCHSA high school team’s bib numbers were put in our folder and listed as our middle school team. We had no middle school numbers! The coach spent about half an hour trying to get that straightened out, but some of our athletes never did get a number to wear. In the meantime, the tent was put up to keep us a little warmer and drier. Without much coaching preparation the middle school team, both boys and girls, headed off to the start. The coach, still having problems, did not know our box number, but Mrs. Dickman figured it out and the team lined up in box 18. The team was finally ready to race through the long 1.9 mile course. John Klaves got off to a good start, leading the team the whole way to finish in the top-50. Rebecca Dickman showed us she is ready to have a great season. She came in just a few seconds after John in 57th place. Faith Caspers is still struggling with toe issues, but she was able to stay ahead of her brother and sister and was our 3rd runner in. Joshua LeSac and Daniel Caspers ran together the whole way. After jockeying back and forth, Joshua stayed just ahead of Daniel at the finish. They both looked good. Julianna Caspers pushed Faith, Joshua, and Daniel along despite losing a shoe midway through the race. She fell behind some going back for her shoe, but caught up with them all later and was just edged out by Daniel at the finish. Kayla Walters was not feeling so good, but she made it to the finish line before losing some of her lunch. Leif Kostrzewa went out a little overdressed and could not give us his best race. He will be better next time. Mia Wickman looked good, especially when the camera was near. We need her to keep improving as the season goes along. Ed Sherman hobbled through the course. Hopefully he can get his injuries behind him soon. Joshua Lipski ran conservatively in his first cross county race. He has put in a lot of work this summer and should have a good season. Naomi Zhou now has her first race behind her. She has a lot of potential and will find it easier next time when the course is shorter. Katrina Lipski struggled in her first race. We need to get her thinking more positively so she can race at her best. Andrea Beck led the way for the high school girls team. Andrea broke 23 minutes for the first time this year as she continues in her role as our Number 1. Kayla Bruton kept up a fast, steady pace throughout. She clocked in with an impressive 24:33 this time. I doubt she has peaked yet. Jessy Homa also continues to improve. She ran hard the whole way and was able to lower her pace per mile from last race despite the extra kilometer. Lucretia Nyhart kept everyone happy as she was back in action for her second race in a row. She ran very well, of course. 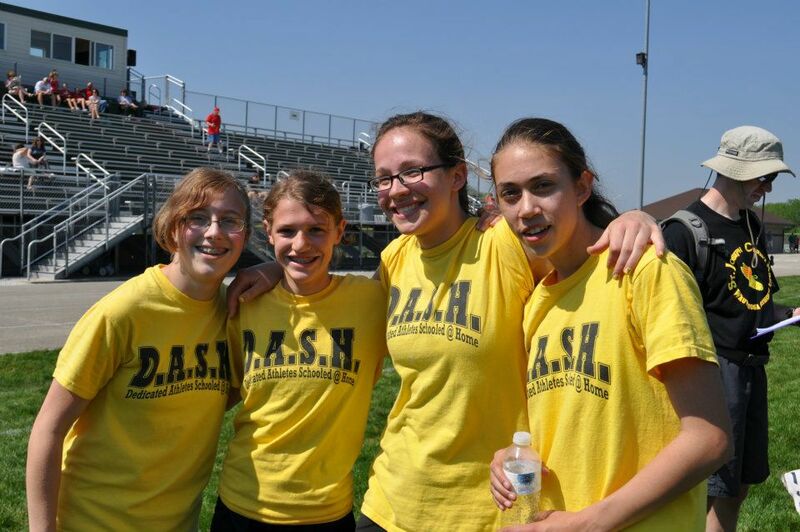 Zipporah Caspers was next for the DASH team. She was actually running ahead of Kayla, but then stopped midway when she did not feel well. She waited a few minutes, and then took off racing fast again to the finish. It would have been nice to see her time without the break in the middle. Stefanie Klaves ran a steady race and is getting faster with each race. Andrea Coulter ran her first 5k. She faded a little at the end, but a few more weeks of practice should get her used to the distance. Renee Walters ran the whole way with her shoes on and was able to cut over six minutes from her previous time. Very encouraging. The drizzle continued for the boys race. Jacob Dickman and Ransom Nyhart got out very fast and were able to push a hard pace to the finish line. Jacob clocked in with a new DASH record of 17:35, and Ransom followed just 11 seconds later, breaking 18 minutes for the first time. The personal records kept coming as Joe Hughes came in with an 18:55. Joe almost burned himself out with his pace through the first two miles, but when Justin Chu caught up to him near the finish, Joe found a second wind. Justin Chu never seemed to tire and really moved up in the second half of the race. His effort was rewarded with his 18:59 time. Justin is setting the bar high and is one to watch. John Sherman looked good and stayed strong to the finish and lowered his best time by 36 seconds. Matt Lange ran his usual consistent race and was able to get his time down to 19:26. These guys are really going fast! Zebulon Caspers ran much better this time out. Zeb had a great finish and got his time down by over 2 minutes. Danny Wickman struggled early, but gave us his usual gritty finish and beat his best time by .01 second. Yes, everyone had best times. The middle school team now has their first race out of the way as they prepare for their big meets ahead. The team is showing signs of being pretty good. We will know a little more about how good after Monday’s race. The high school girls are running better each race and I know they will be even better the rest of the way. The high school boys were supposed to be good and they are meeting all expectations. We have never had a boys team this good, so be sure to enjoy it. 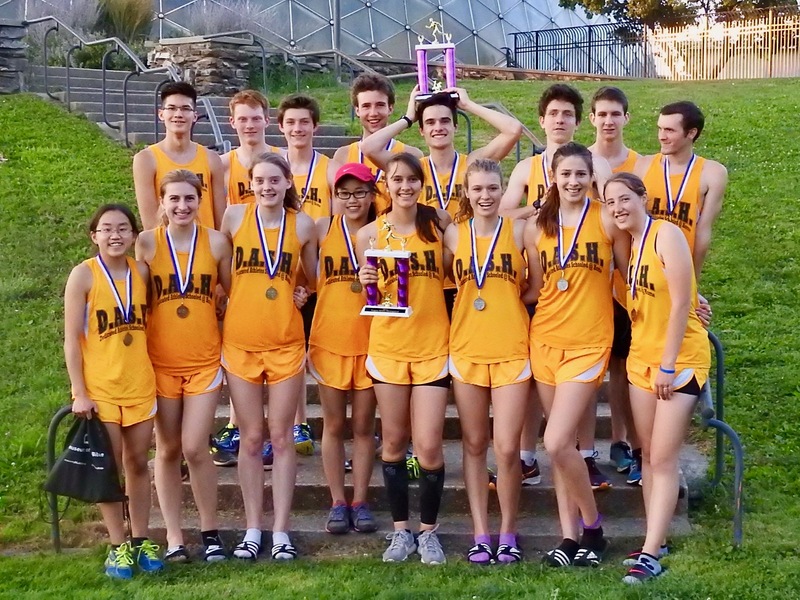 The high school team now has two weeks between races. It is a chance to get some good workouts in so we will be ready for the final swing of big races ahead. In five weeks the season will be over, so keeping ourselves healthy is the most important thing. It will be an exciting five weeks, indeed. 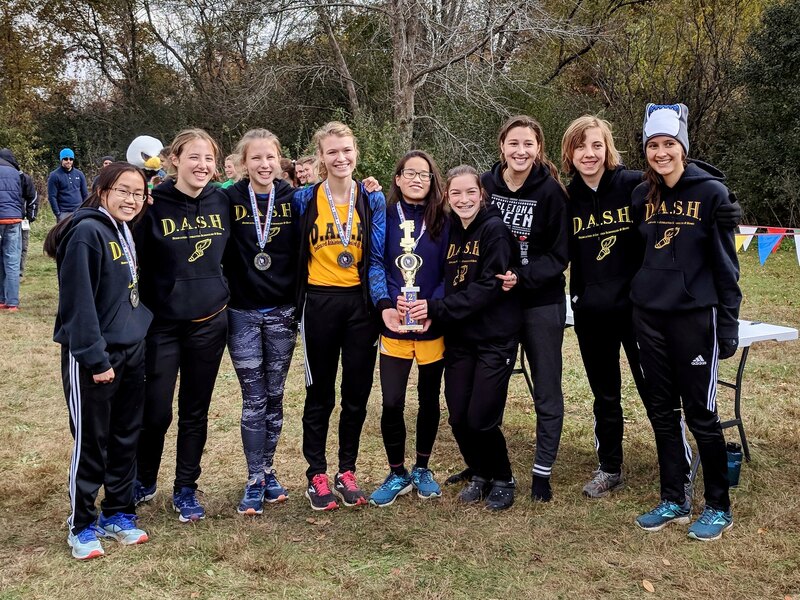 The DASH high school cross country team took advantage of some cool weather to post some great times at Waukesha South’s Blackshirt Challenge last Saturday. 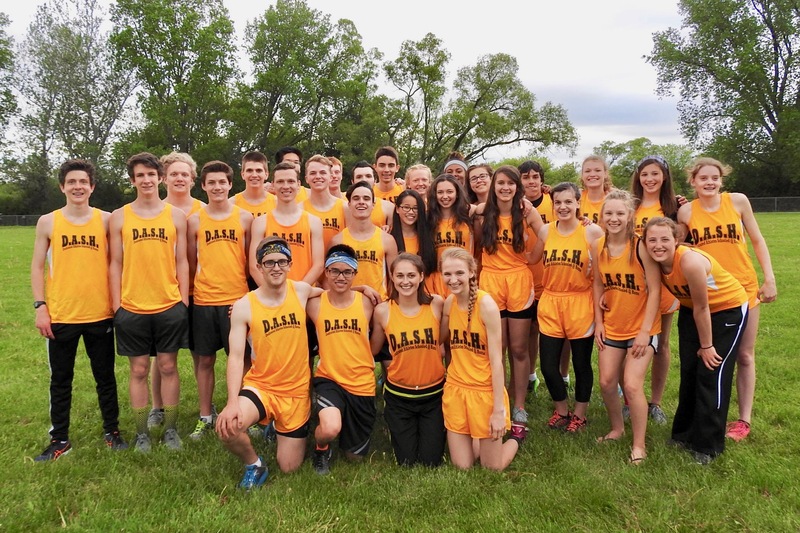 Minooka Park may be the toughest course we will run all year, but that did not stop the team from setting numerous personal records, and placing very well in the team scores. All the girls but Andrea Beck toed the starting line for the 4k race to get the meet started. After a nice start by all the girls, it was Kayla Bruton who emerged from the woods as the DASH leader. Kayla never slowed to the finish and posted a very good time of 20:19, good for 15th place. Hannah Schein ran through a hip injury, yet was able to give the team a nice 18th place finish. Lucretia Nyhart kept a smile on the DASH fans faces, especially her mother’s, as she showed off her natural talent to finish close behind Hannah. Jessy Homa may have improved more than anyone else from the last race. Jessy finished in 21:18 and cut a full 30 seconds off her mile pace. DASH veteran Zipporah Caspers struggled again this meet. Some extra practicing has been agreed on to get her back running fast. Stefanie Klaves paced Andrea Coulter through her first race. After a few more races Andrea should be moving up. 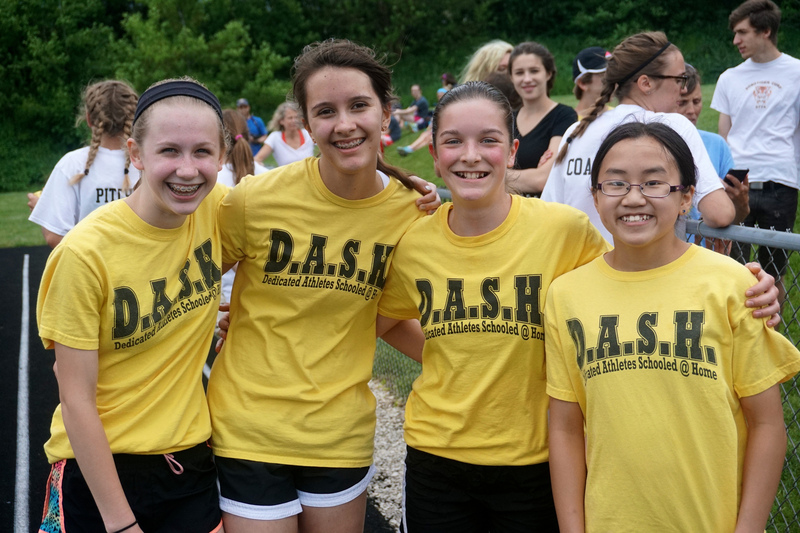 Andrea Beck was the DASH representative in the girls 5k race. She struggled a little in the middle of the race, but had a good finish up the big hill to keep her time in the 23’s. She will be back with the rest of the girls from hear on out. The boys team was looking to improve on their ninth place finish from last year at this meet. Jacob Dickman went out with the leaders and stayed in the top-10 the whole way while breaking 18 minutes for the first time. He is now nearing the DASH record time of 17:37. Stay tuned. Ranson Nyhart ran conservatively early on, but made a big push up the hill at the end to finish in 17th place. Joe Hughes gave us his usual great effort, and was able to lower his best time by 10 seconds. He needed to run that fast to stay just ahead of Matt Lange who raced to his own personal record which now stands at 19:46. John Sherman was sick earlier in the week, but was still able to cut off over 30 seconds from his previous time and break 20 minutes for the first time this year. Justin Chu has also been sick this week. He was slowed some, but finished with a respectable time in the low 21’s. Zebulon Caspers ran sporadically, but was able to finish the race this time. Danny Wickman, in his second race, cut over two minutes off his time as he continues to run strong. 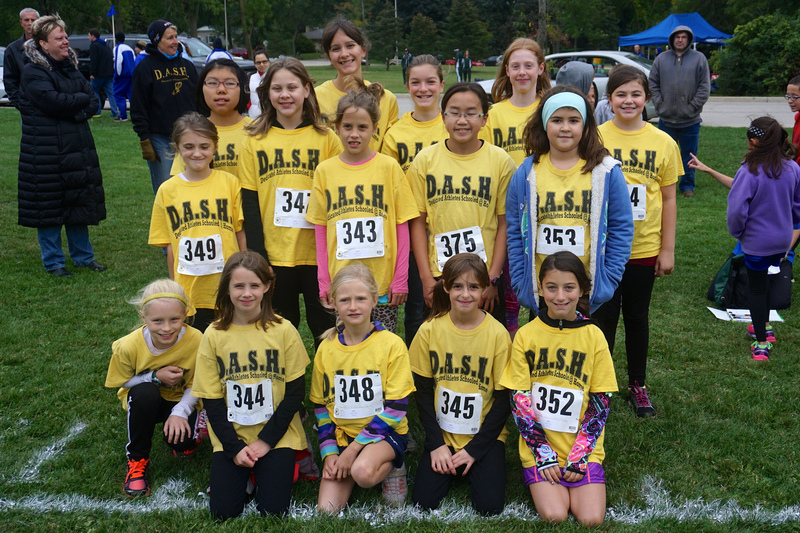 Our girls 4k team finished in 3rd place out of 5 teams that scored. That is a big improvement over last week’s race and bodes well for our races ahead. 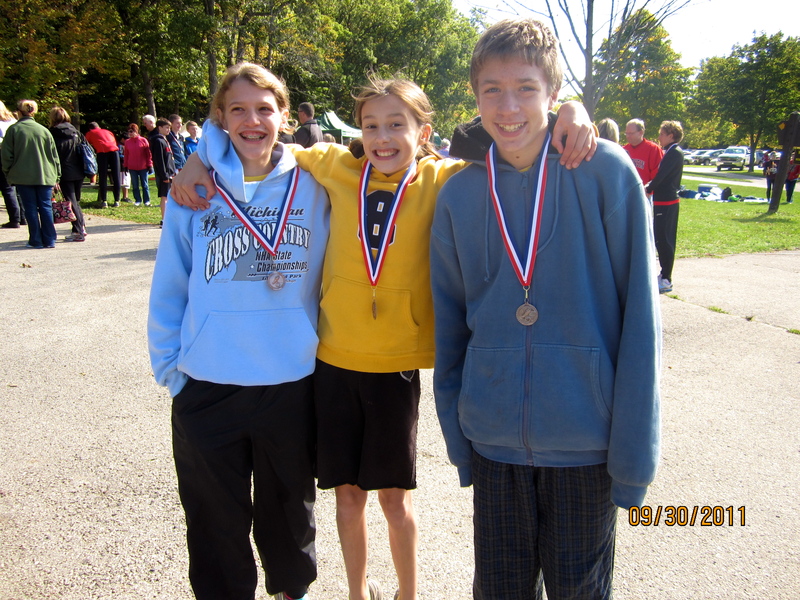 Jacob Dickman and Ransom Nyhart were called up for top-20 medals at the award ceremonies. It felt good to have our stars called up after we just missed out on the medals last year. 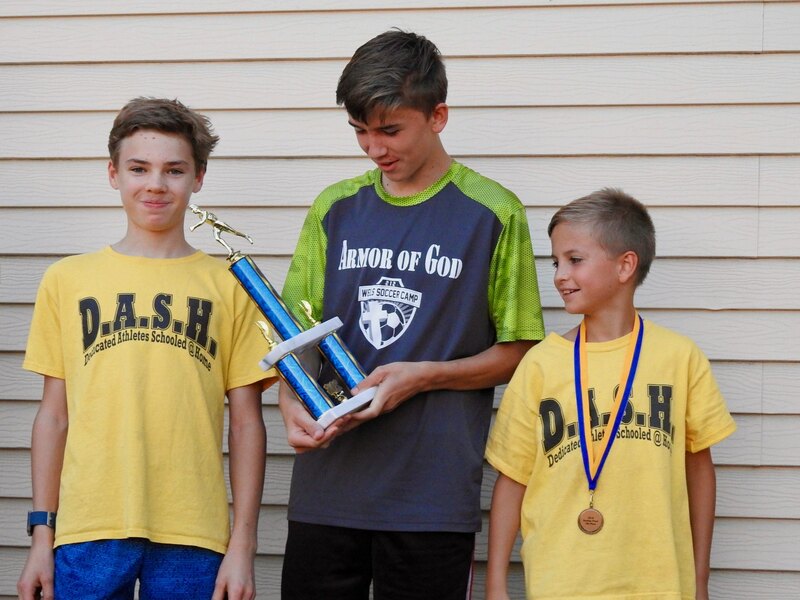 It took a while before we heard the DASH boys team called out in the team standings. We finished in 6th place overall, and finished ahead of all the teams that I thought we could beat. In some of our smaller meets ahead, if the boys stay healthy they will be one of the favorites to win. The next six weeks are going to be interesting. Thanks to Mary Beck, Pan Schein, and Kam Caspers, along with the DASH athletes Grace and Julianna Caspers who helped pass out water to the athletes at the end of the race. Volunteering like this gives the DASH team a good name. Thanks to Ed Beck for his help with the coaching. Thanks to great DASH fan Pete Dickman who brought his bicycle to get around the course and spur the athletes on. Thanks to Faith Caspers for once again getting the photos. Thanks to the parents who got the athletes to the meet. Now we need to keep these athletes healthy and practicing so we can continue to improve and make this season special.